The European insurance industry capital regulations called ‘Solvency II’, which came into effect in 2016, have created constraints on the assets insurers can hold and the risks that can be taken. This paper demonstrates how convertible bond investment strategies can provide significant capital requirement relief without sacrificing insurers expected return on invested assets. Convertibles have three key advantages. Since tracking began, convertible bonds have had better risk adjusted returns than other asset classes, and perform especially well in periods of rising interest rates. The structure of the Solvency Capital Requirement tests is favourably disposed to convertible strategies. The equity test does not penalise higher volatility or beta investments. This is advantageous to convertible portfolios since convertible bond issuers tend to have higher volatility equity prices. The ‘cyclical adjustment’ highlights the value of the convertible ‘bond floor’. The spread test is relatively less severe on lower duration assets. This is advantageous to convertible portfolios since convertible bonds have very low effective duration. 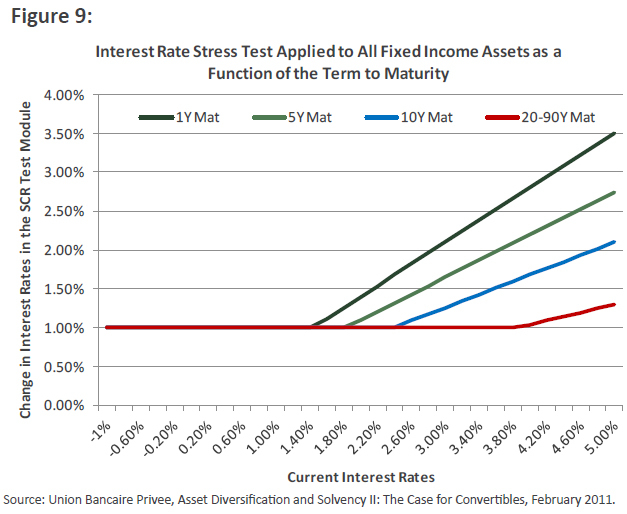 The interest rate test favours assets that have a short duration relative to their maturity. The ratio between a convertible bond’s duration and its maturity is low. The concentration test incentivises diversification across issuers. There is little issuer overlap between convertible bond indices and straight debt or equity indices. Long only convertible funds can provide asymmetric returns with comparable upside to equities, but with significant downside protection. Balanced convertibles can be a risk reducing substitution to equities, and defensive convertibles can be a return enhancing substitution to fixed income. Strategies with a short equity component such as convertible arbitrage are an especially valuable tool for achieving capital relief, when combined with insurers’ equity portfolios. A capital constrained insurer can reduce capital requirements and boost upside returns significantly by substituting convertibles for either equity or fixed income assets. In a 60/40 portfolio, substituting 10% balanced convertibles for 5% investment grade corporate bonds and 5% equity potentially reduces capital requirements on the whole portfolio by 133-155 bp (~5%), and can boost total portfolio upside returns by 86-128 bp (~4%). For an equity portfolio, a 10% substitution to hedged convertibles can reduce capital requirements by 717 bp (~13%); while a 10% substitution to balanced or defensive convertibles can reduce capital requirements by 400-459 bp (8-9%) respectively without significantly affecting upside return (-183 bp to -304 bp). For a fixed income portfolio, a 10% substitution to investment grade defensive convertibles can reduce capital requirements by 20 bp (4%) while potentially boosting upside return by 252 bp; and a 10% substitution to hedged convertibles can potentially boost upside return by 309 bp for the same level of capital. A 10% substitution from investment grade to a blend of convertible strategies can reduce capital requirements by 31 bp (6%), while increasing the upside return by 295 bp. 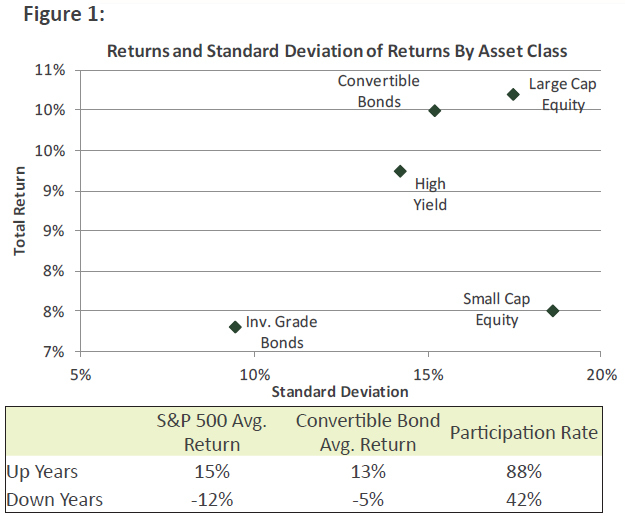 Convertibles have been the best performing asset class since tracking began (December 1972) with returns comparable to large cap equity, but at significantly lower volatility. Convertible bonds have outperformed investment grade debt, high yield debt, and small cap equity in terms of both absolute return and Sharpe ratio. Since 1972, in up years convertible bonds have captured nearly 90% of the S&P 500, while in down years, the decline was nearly 60% less than the S&P 500. 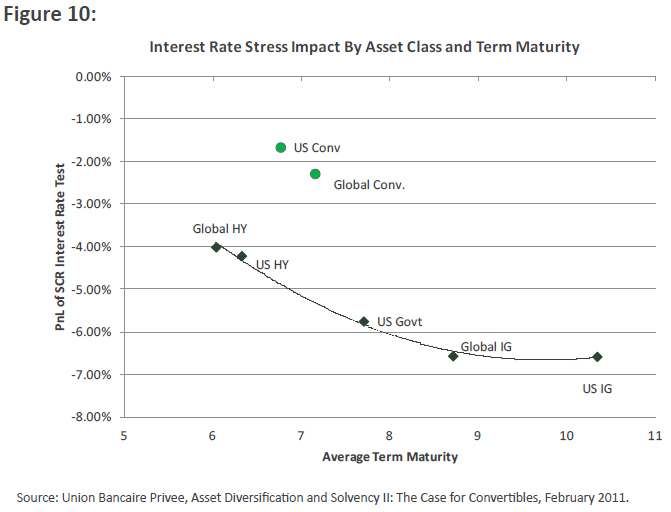 Because of their low duration, positive interest rate convexity, and asymmetric equity sensitivity, convertibles historically outperformed many other fixed income asset classes in periods of rising interest rates. In the ten periods since 1992 when the 10-Year Treasury yield rose by at least 100 bp, convertibles have outperformed many other fixed income assets by a wide margin. 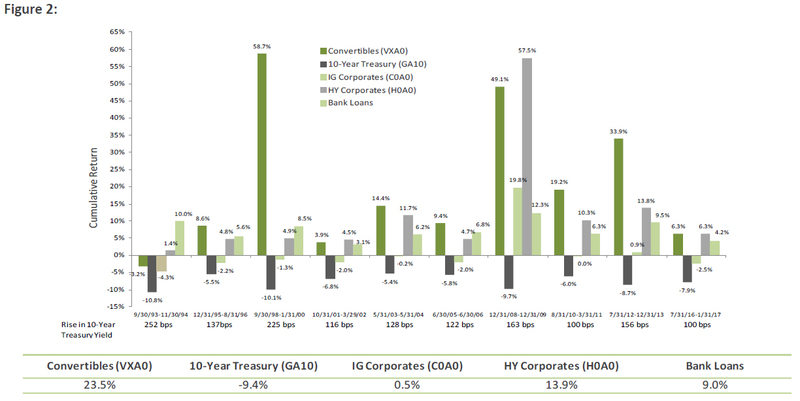 On average, convertibles have returned 23.5% versus 13.9% for high yield and 9% for bank loans, while investment grade corporates were flat, and 10-Year Treasuries lost -9.4%. They have outperformed other fixed income asset classes in eight of the ten periods, with negative returns only from September ‘93 – November ‘94, when small cap equities were down -3.50%. The European Insurance Regulatory body, EIOPA, has instituted a regulatory capital regime which came into effect in 2016 called Solvency II. The purpose of Solvency II is to minimise the risk of widespread industry failure. Specifically, the regulatory body seeks to ensure that insurers have sufficient capital to survive a “one in two hundred year” risk scenario called the Solvency Capital Requirement (SCR) test. To this end, they have crafted a series of stress tests intending to model the effects of a worst case scenario on all parts of an insurer’s business. There are several “modules” that provide stress test details, parameters, and required formulae that focus on both assets and liabilities. The structure of the EIOPA is to provide detailed methods, templates, and standardization. However, the execution and compliance verification are largely left to country specific insurance regulators. Therefore, there could be local differences in the application of the rules. For example, while EIOPA provides copious detail on the methods for performing the tests, there are still some issues that leave room for interpretation. While the SCR test provides a target, there is a more loosely defined Minimum Capital Requirement (MCR) that allows local regulators to establish minimum capital at 20-40% of the SCR. The difference between the MCR and SCR gives regulators “room” to intervene and prescribe the shoring up of capital prior to determining an insurer to be insolvent or in need of public take-over. 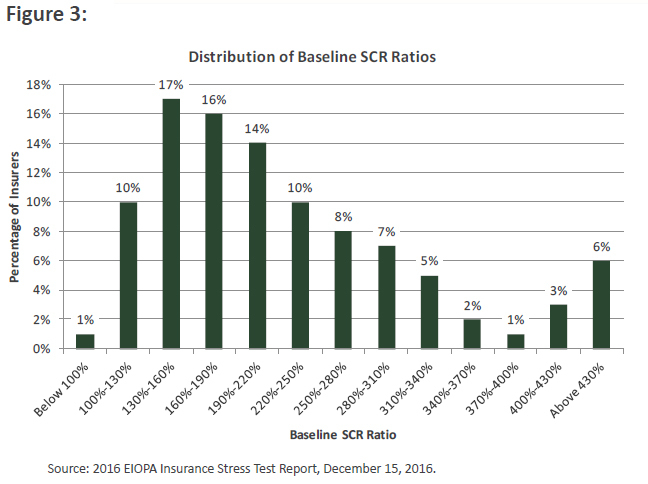 In addition to the SCR, and the MCR, regulators conduct other stress tests, such as “lower for longer” and “double hit” to provide additional detail on an insurance company’s capital adequacy. European insurers’ investment assets represent a significant part of the capital requirement. To the extent that asset values can decline in a one in two hundred year crisis, insurers are required to hold capital against such potential outcomes. Since holding more capital impacts insurers’ return on capital metrics, this can have a significant impact on the enterprise value of the business. Therefore, the regulatory framework indirectly incentivises insurers to reduce investment risk in order to conserve available capital. Great care and diligence has been devoted to creating a regulatory capital calculation that fairly represents economic capital risk. A primary aim of regulators has been to provide a stress framework that reasonably and accurately approximates economic risks. It is difficult for standard regulatory models to capture detailed economic effects with perfect accuracy, or even to the same extent as some of the more sophisticated ‘internal’ models. Whether real opportunities exist for ‘regulatory arbitrage’ or not, it is clear that insurers must consider both expected risk adjusted return on regulatory capital, and expected risk adjusted return on economic capital, in allocating capital and making investments. Some equity investments can be stressed by up to 65% in the SCR, requiring 10-20 times as much regulatory capital as less risky investments such as government bonds – as risk is defined in the SCR capital tests. Equity investments would require a much higher “hurdle” in terms of expected return, versus government bonds, in order to have a similar risk-adjusted return on capital. If the SCR ratio between two investments does not perfectly represent economic reality, it artificially creates an incentive to re-allocate in order to maximise regulatory capital. 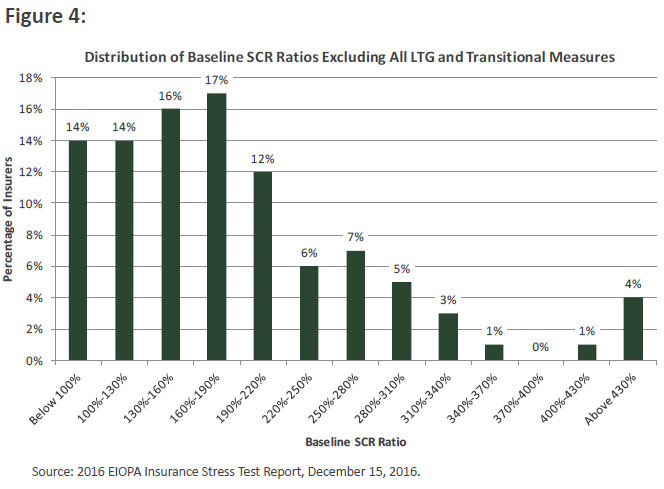 This incentive is more significant for insurers where SCR test results show less excess capital (Total Capital – SCR). Currently, only 1% of insurers are in a deficit of excess capital to SCR. For insurers with sufficient excess capital, it is purely an economic consideration that determines capital allocation, and regulatory considerations are relatively minor. Nevertheless, there are two certain changes, and one potential change, that could reduce excess capital in the future. The first change is that the SCR test itself will become more restrictive over time. Currently, there are ‘transitional measures’ that have temporarily lowered the SCR bar significantly. As turnover of equity portfolios takes place, the stress, and hence capital requirements, on equity portfolios will gradually increase. Secondly, market events, and consequent changes in investment values, will cause changes in excess capital. In a recession, or market pull back, if investment values decline, capital declines, while regulatory capital requirements remain relatively unchanged, reducing excess capital. There are two sets of provisional measures in transitioning to the Solvency II regulatory capital regime. One set is the “Transitional Measures on Technical Provisions”, which is effectively a haircut of equity stress tests on equities owned before 01/01/16. The second set is called the “Long-Term Guarantees” and pertains to stress testing methods related to the extrapolation of risk-free rates and equity volatility. The average impact of the transitional measures is very significant. On average, the SCR ratio is approximately 183% with the transitional measures, but only 115% without them. In individual countries, the difference can be much greater. For example German insurers have 340% with transitional measures, but only 118% without them. Portugal has a 107% SCR ratio with transitional measures, but only 59% without them. Both of these effects make the consideration of expected risk-adjusted returns on regulatory capital relevant for a much larger share of European Insurers. Other changes that could make regulatory capital, rather than economic capital, the constraining factor would be changes to the regulatory capital rules that remove “relief” currently given to insurers. One such change would be the disallowing of the “loss-absorbing capacity” of liabilities to diminish the effect of changes in interest rates on insurance invested assets. Another would be to include, or make permanent, additional stress tests such as the “lower for longer” or “double hit” test. For firms with less excess regulatory capital, it its worth considering regulatory risk-reducing substitutions in portfolios that provide capital relief, without negatively impacting expected risk- adjusted return on economic capital. Reviewing the mechanics of the SCR tests provides valuable insight. This paper presents analysis that demonstrates the comparative efficiency of convertible bond strategies in the SCR framework. It provides sample re-balancing allocations that can increase expected returns and reduce both economic and regulatory risk. It considers primarily the following three strategies: long defensive convertibles, long balanced convertibles, and long-short ’hedged’ convertibles. 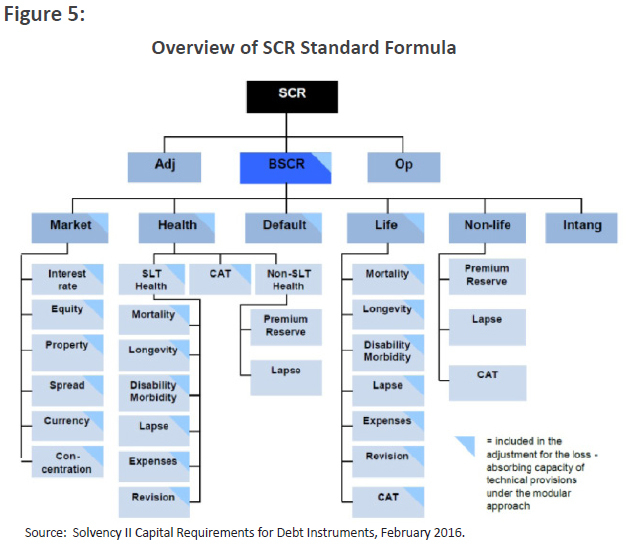 There are six main categories of stress that comprise the SCR stress test: market risk, health (actuarial), life (actuarial), non-life (actuarial), default, and intangible. For the purposes of evaluating investment capital requirements, the only relevant category is the market risk category. Within the market risk category, there are six modules: interest rates, equity, property, spread, currency, and concentration. Two of these modules bear little relevance for our analysis. First, property risks are specifically concerned with non-securitised land and buildings. REITs, and other property related securities, are excluded as they are stressed according to other market risk modules. Second, the currency module is the second of low relevance to our analysis. Since we are evaluating investments on a hedged-to-base-currency basis, significant swings in currency exchange rates are largely moot. While hedging costs are subject to mutable factors, the effects are relatively small and are unlikely to have significant effect on asset allocation decisions, at least as far as regulatory capital requirements are concerned. Therefore, equity, spread, interest rate, and concentration are the four risk modules considered in our analysis. The structure of all four stress modules give regulatory capital credit to the risk mitigating properties of convertible bond strategies. Equities domiciled in countries belonging to either the Organization for Economic Co-operation and Development (OECD) or the European Economic Area (EEA) are stressed at an unadjusted rate of 49%, while non-OECD/EEA equities are stressed at an unadjusted rate of 56.5%. An adjustment factor of up to +/- 7.5% is then applied to the stress test rate. This is called the cyclical adjustment (CA) and it is calculated and posted on the EIOPA website. As of the end of April 2017, the CA was negligible. Equity-linked assets, such as options and convertible bonds, are re-valued assuming a drop in the underlying equity price as prescribed in the aforementioned rules. EIOPA guidance is vague as to whether simultaneous changes to equity volatility are permitted. Therefore, we have performed the stress test inclusive and exclusive of shocks to equity volatility. It is our opinion that shocking volatility is and should be allowed because it is inconceivable that equity prices could drop 40% to 65% without significant increases in equity volatility. Equity Risk Sub Module Calibration documentation describes a relative equity volatility increase of 50% as equities decline. For convertible bonds, which typically have an implied volatility of 30%, this translates into a 15 volatility point increase. There are several significant ways in which convertibles are treated favourably in the structure of the equity test. First, the stress is applied as a function of country and market cycle, not beta or volatility of the equity. Since the convertible asset class historically holds a high percentage of higher beta and volatility constituents, it means that the regulatory capital test is less severe than is implied by the economic risk. 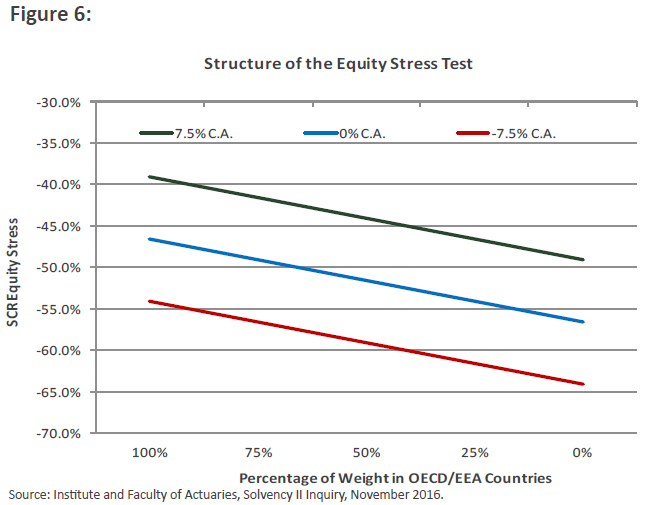 Secondly, the equity stress penalises non-OECD/EEA issued equities. The global convertible asset class has been underweight these countries versus the MSCI World equity index, resulting in a somewhat less severe stress than global equity. Additionally, there is no risk parameter in the Solvency II test for the richness or cheapness of the convertible market (versus theoretical value). 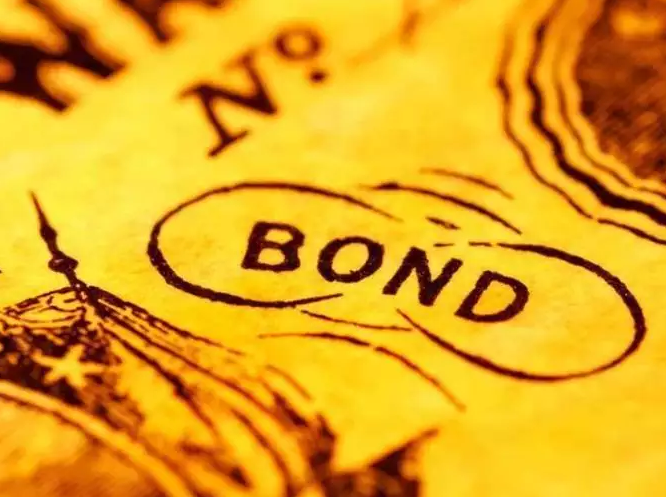 Convertible bonds have tended to cheapen slightly in a crisis, but because there is no parameter to model this effect, there is no regulatory capital penalty applied to convertibles strategies. Finally, the cyclical adjustment, which creates a 38% swing in equity stress severity, works to the significant advantage of convertible strategies. Convertibles possess a property known as ‘gamma’, the change in ‘delta’ or sensitivity to the underlying equity price, which is the asymmetry of returns caused by a convertible bond price approaching its ‘bond floor’, or the price at which the convertible would trade if the equity warrant was worthless (i.e. deep ‘out of the money’). This means that for a balanced convertible bond, the participation rate versus equity is significantly less on the variable portion of the equity stress module created by the ‘cyclical adjustment’. When the effect of a stress in equity prices on equity volatility is taken into consideration, the downside participation rate falls even further. Because the Solvency II equity stress test recognises these effects, the cyclical adjustment has a very favourable effect on the regulatory capital cost of convertible bonds relative to equity. The spread stress is applied to all fixed income investments and is primarily based on the credit quality and duration of the investment. A special stress for EEA government bonds does exist and is not modelled in this analysis. Although convertible bonds are subjected to both the equity and the spread stress, the spread stress treats spreads relatively mildly. 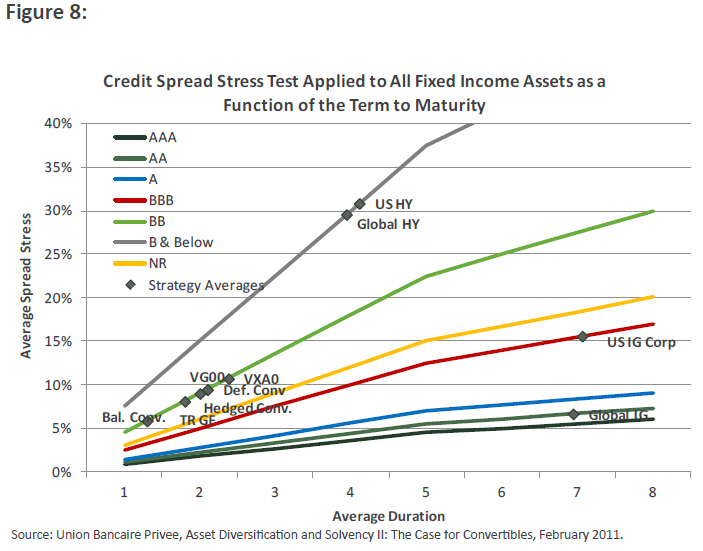 In particular, non-rated securities stress levels are just slightly higher than BBB. This fairly represents the convertible asset class where a significant percent of non-rated securities are issued by investment grade issuers. A severe equity stress, combined with a moderate spread stress is especially favourable to the hedged convertible strategy. Long convertible “bond floors” generally hold up well with moderate spread stress, while short equity positions do extremely well given the severe equity stress. Interest rates are stressed up and down, and the minimum of the two is used. For most rate sensitive assets, this would be the up stress. Except where rates are already higher (emerging markets, Australia, longer term US bonds) the minimum rate stress of 100 bp is the applicable stress for most assets. We believe convertible bonds would perform relatively well under this test due to shorter durations and positive convexity. As rates increase in the future, the rate stress on many OECD and EEA bonds will increase. For convertible bonds, with a low duration to maturity ratio, we believe the rate stress increase will not be as significant. While European issuers are generally well-matched in terms of asset-liability durations, information provided in the October 2016 EIOPA stress test review suggested that there could be pockets of duration mismatch. Reducing interest rate sensitivity can be achieved by re-allocating from longer duration straight debt into convertible bonds, which historically have much lower effective duration due to the negative duration of the embedded equity option. 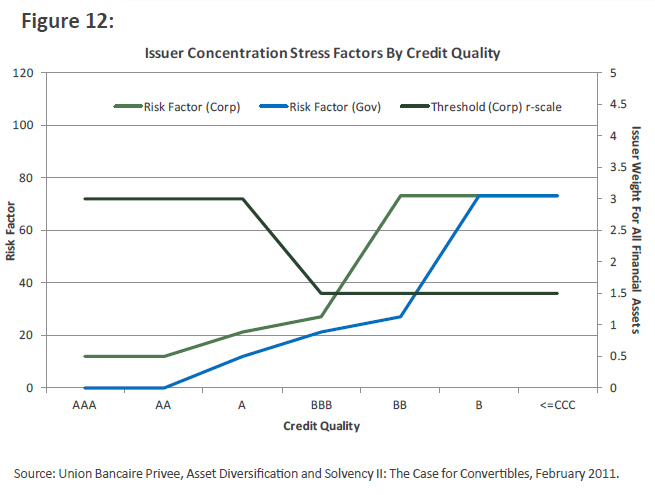 The concentration test favours convertible strategies because issuer group concentrations above 1.5% of assets receive severe treatment in this stress test. In our view, because there is little overlap between convertible bond issuers and high yield or large-cap equity index issuers, convertible allocations offer significant relief to the capital requirement implications of this rule. In the equity stress portion of the capital requirement test, equities lose 48%, while hedged convertibles gain 16% due to the short equity positions. 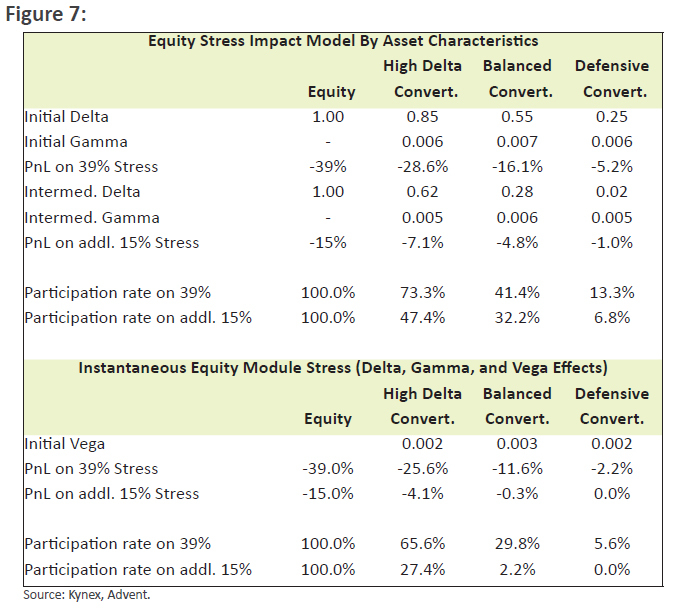 In the combination of all stresses, equities lose 48%, hedged convertibles gain 15%, and high yield loses 6%. Since hedged convertibles perform better than high yield in the stress tests, they have a bigger risk reducing impact on the overall portfolio. A 10% reallocation from equity to hedged converts hypothetically reduces regulatory capital by 13.2%, versus 8.7% for high yield. The paradox is that hedged convertibles would have a higher capital requirement than high yield bonds if the test calculated each asset class (strategy) separately. In theory, the capital requirement of a single investment is effectively the absolute value of the stress test result. However, the regulatory test gives full credit to the downside protection offered by hedged convertibles when they are blended in an equity portfolio. Even if regulators chose to treat short equity separately from long convertibles, the capital requirement relief can still be achieved by placing both legs in total return swaps. The SCR for market risk is essentially the square root of the sum of the squares of the equity, spread, rate, and concentration stresses plus the interaction of equity, rates, and spreads according to a specified correlation matrix. This process of calculating effects separately, and then combining them using a one-size-fits-all set of assumed correlations, is somewhat cruder (less reflective of reality) than a multi-factor Monte-Carlo full re-valuation process would be, but likely favours convertible bond strategies. The correlation between equity and rate effects, and the correlation between spread and rate effects, is usually negative in reality, but is forced to be positive in the regulatory stress. Since convertible bonds have the mildest rate sensitivity of any of the fixed income asset classes, they should be less negatively affected by the capital burden of this regulatory assumption. Our analysis shows that a capital constrained insurer can reduce capital requirements and boost upside returns significantly by substituting convertibles for either equity or fixed income assets. In a 60/40 portfolio, substituting 10% balanced convertibles for 5% investment grade corporate bonds and 5% equity, potentially reduces capital requirements on the whole portfolio by 133-155 bp (~5%) and can boost total portfolio upside returns by 86-128 bp (~4%). For an equity portfolio, a 10% substitution to hedged convertibles can reduce capital requirements by 717 bp (~13%), while a 10% substitution to balanced or defensive convertibles can reduce capital requirements by 400-459 bp (8-9%) respectively without significantly affecting upside return (-183 bp to -304 bp). Balanced convertibles: Convertible Bonds with Delta (Equity Sensitivity) between .40 and .80. Defensive convertibles: Convertible Bonds with Delta (Equity Sensitivity) less than .40. Convertible Arbitrage/Hedged Convertibles: An investment strategy wherein a portfolio is comprised of long convertible bonds and short equity positions. Typically the short equity position neutralises all or almost all of the equity sensitivity of the convertible bonds. In this study the convertible arbitrage metrics were modeled using a representative-asset method in the KYNEX risk system. Source: Bank of America Merrill Lynch and, prior to June 1992, Ibbotson Associates. Investment Grade Bonds are represented by the Bank of America Merrill Lynch Corporate and Government Master Index (B0A0). High Yield Bonds are represented by the Bank of America Merrill Lynch High Yield Master II Index (H0A0). Convertible Bonds are represented by the Bank of America Merrill Lynch All U.S. Convertibles Index excluding Mandatories (V0A0). Large Cap Equities are represented by the S&P 500 Index. Small Cap Equities are represented by the Russell 2000 Index. Past performance is not a guarantee of future results. Up/down years are defined as years in which the S&P 500 posted a positive/negative return. Participation rate is the convertible average annual return divided by the S&P 500 average annual return. Information shown is from the period 12/31/1972 through 5/31/2017. Sources: Bank of America Merrill Lynch Convertible Research; www.federalreserve.gov; Bloomberg, Credit Suisse. VXA0 is the Bank of America Merrill Lynch All U.S. Convertibles Index. GA10 is the Bank of America Merrill Lynch Current 10-Year U.S. Treasury Index. C0A0 is the Bank of America Merrill Lynch Corporate Master Index. H0A0 is the Bank of America Merrill Lynch High Yield Master II Index. Bank loan performance is represented by the Credit Suisse Institutional Leveraged Loan Index (CSILLI). Periods of rising interest rates are defined as an increase in the 10-year Treasury Yield of 100 basis points (1%) or more. Information is shown for the periods since the inception of CSILLI on January 1, 1992. Lower for longer is a scenario used to stress the duration mismatch between assets and liabilities of insurers. The stress test requires flattening of the risk-free rate curve, shifting 20 year durations down by 100 basis points and longer durations down to an ultimate forward rate of 2 percent. This stress significantly impacts insurers with a duration mismatch between liabilities and liabilities, leading to a fall in excess assets. Countries with higher duration gaps such as Germany and Austria, insurers could lose 33% of excess assets. The double hit scenario involves a rapid increase in yields on sovereign bonds, affecting the entire yield curve and leading to a steepening of cash yield curves of approximately 120 basis points on average, and a fall in swap rates of between 60 and 70 basis points. Additionally there is an equity price shock of 33% on average, and corporate bond yield widening of between 16 and 520 basis points depending on credit quality. This stress test resulted in a 29% reduction in average excess assets. Sources: ‘Scenario for the European Insurance and Occupational Pensions Authority’s EU-wide insurance stress test in 2016’, dated March 217, 2016, available at https://eiopa.europa.eu/Publications/Surveys/ESRB%20Double%20hit%20scenario%20for%20EIOPA%202016%20insurance%20stress%20test.pdf#search=%22Double%20Hit%22; and ‘EIOPA Announces Results of the 2016 EU-Wide Insurance Stress Test’, dated December 15, 2016, available at https://eiopa.europa.eu/Publications/Press%20Releases/2016-12-15%20Insurance%20Stress%20Test%20ResultsFinalFinal.pdf. Source: 2016 EIOPA Insurance Stress Test Report, December 15, 2016. Source: Natixis Asset Management, Solvency II Capital Requirements for Debt Instruments, Impact of Solvency II on Debt Markets. February 5, 2016. Source: ‘CEIOPS’ Advice for Level 2 Implementing Measures on Solvency II: Article 111 and 304 Equity risk sub-module’, dated January 29, 2010, available at https://eiopa.europa.eu/CEIOPS-Archive/Documents/Advices/CEIOPS-L2-Advice-Design-and-calibration-of-the-equity-risk-sub-module.pdf.